You are the queen tonight and your wedding gown is your royal garb. Find the dress of your dreams by browsing through the Bridal Salons below. 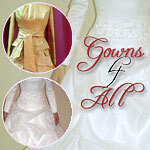 Stasia lets brides create their wedding gown by choosing from over 1000 different combinations to create their gown. Stasia's patent pending process corrects for sizing delivering a perfectly fitted gown.